MK Ofer Shelah refuses to join in Yesh Atid's efforts to boot Hanin Zoabi from the Knesset. A senior Yesh Atid MK has announced that he refuses to join party head Yair Lapid's efforts to oust controversial Arab-Israeli MK Hanin Zoabi from the Knesset. On Sunday, Lapid suddenly announced that he would lead a new campaign aimed at booting Zoabi from Israel's legislature. According to Lapid, Zoabi's remarks two weeks ago that 'millions of Palestinians' should march on Jerusalem following the violent riots in Gaza crossed a red line. According to the Knesset's bylaws, an MK can be ousted if 90 other lawmakers support the move. "There is no parliament in the world that would let a terror supporter serve in it," said Lapid. "I do not say that the Joint List party should be disqualified, but Balad should be disqualified because it supports terror, and Hanin Zoabi should not be in the Knesset because she supports Hamas." 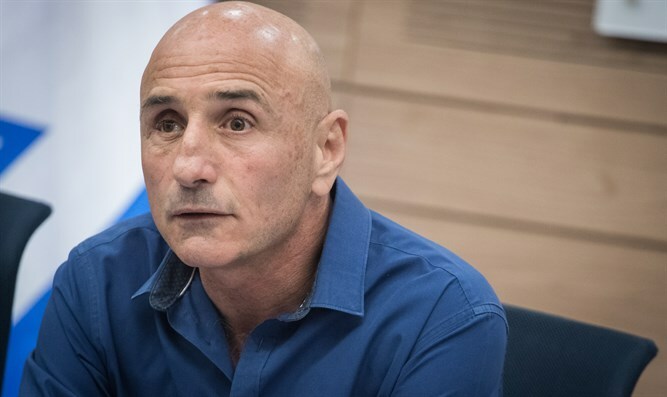 However, Yesh Atid Knesset faction whip Ofer Shelah announced that he would not join in the anti-Zoabi effort, contending that the move was undemocratic and stemmed from populist motives. "Anyone who opens now, for reasons of political distress, in a campaign to oust Zoabi from the Knesset, is doing her a service that she does not deserve," Shelah wrote on his Facebook page. "Instead of disappearing from our consciousness as is proper, she is appearing as someone who is fighting for democracy." "I do not like Hanin Zoabi. She is a lowly provocateur who crosses every line for headlines," Shelah said, adding that "the coalition should not be allowed to use the despicable tool it invented." "We objected to this law, and as chairman of the faction, I promised myself that I would do everything possible so that it would never be used," he said. "If Zoabi violated the Anti-Terrorism or Incitement Law or any other law against which an indictment will be filed then we will remove her immunity, such as what happened to Basel Ghattas. I will not sign the initiative to oust her," Shelah said. Ghattas was an Arab-Israel MK who was forced to resign from the Knesset after being caught smuggling cell phones to security prisoners. He was sentenced to a two-year prison term. Zoabi has infuriated Israelis with a long line of controversial anti-Israel statements and actions. In 2017, Zoabi said that Israel is "closer to the Nazi regime" than she herself is. She has also claimed that "Jews are not a nationality, so we cannot talk about self-determination for the Jewish people" and said that Israel leaving Judea and Samaria is not enough, since "Zionism should leave from the whole area." In addition, Zoabi said that she views sovereign Israeli territory as “occupied” Palestinian territory. In 2016, during a discussion in the Knesset on the reconciliation agreement with Turkey, she openly called IDF soldiers “murderers”. The Knesset first passed a bill in 2016 enabling legislators to oust fellow MKs who support armed struggle or incite racial hatred. Under the terms of the law, an MK can only be booted from the Knesset if 90 lawmakers support the move and it can not be used during an election period.